It's nice to have a wide variety of recipes to choose from: family favorites handed down through the generations; crock-pot recipes that cook all day; recipes that can be prepared in 30 minutes or less; recipes for comfort food that nourish the body and soothe the soul; recipes that can be assembled the night before and baked the next day. The last category is a real timesaver, especially when you want to serve a nice breakfast. Although not a souffle in the traditional sense, French Toast Souffle is a light airy dish that elevates French toast from ordinary to extraordinary. Although the word "souffle" may sound intimidating, this recipe is really easy to prepare. You don't even need a souffle dish. It's baked in a 13 x 9 x 2-inch baking dish. Start by cooking a combination of brown sugar, butter and corn syrup in a saucepan. If you've never worked with cooked sugar before, take it from me, it's hot. I have the scar to prove it! Don't touch the mixture with your hands and try to avoid splatters. Pour the mixture in the baking dish, spreading it to cover the bottom completely. It hardens fast so work quickly. The original recipe used a loaf of cinnamon bread cut into 1-inch thick slices. I've never been able to find unsliced cinnamon bread so I substitute a loaf of sliced cinnamon bread. Since the slices are thin, I use two slices for each serving. 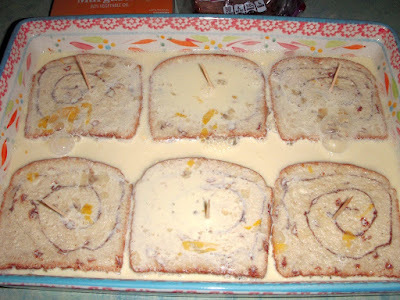 Stack the bread on top of the brown sugar mixture, inserting a toothpick in each serving to hold the two slices together. 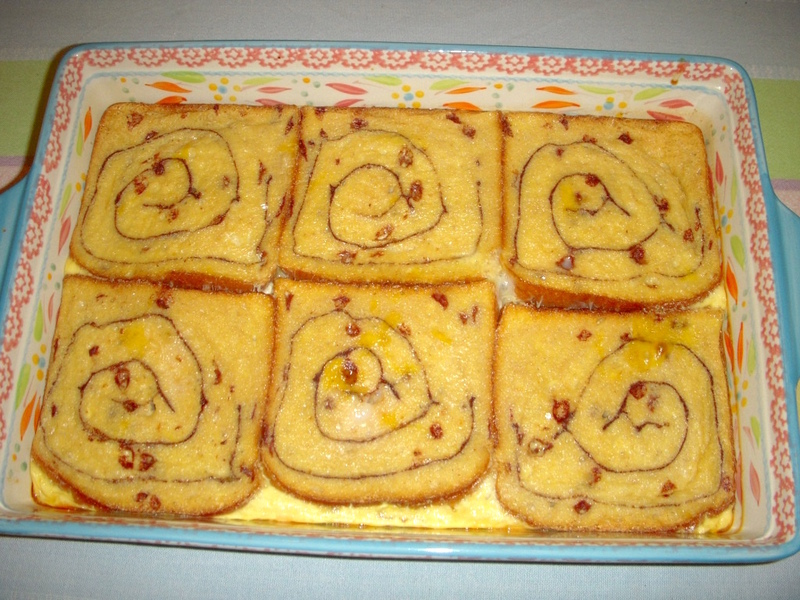 The remaining ingredients -- eggs, half and half, vanilla and salt -- are combined and poured over the bread. For additional flavor, a dash of cinnamon can be added to the mixture, if desired. Cover the pan and put it in the refrigerator overnight. 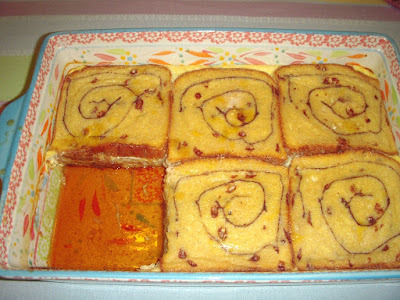 The next morning, remove the pan from the refrigerator and let it stand at room temperature while the oven preheats. It takes 40 to 45 minutes for the souffle to cook, but it's worth the wait! When cooked, the brown sugar mixture melts and becomes a delicious sauce that can be spooned over the French toast in place of syrup. Add some bacon and fresh fruit and you've got a meal that everyone will think you spent hours preparing! 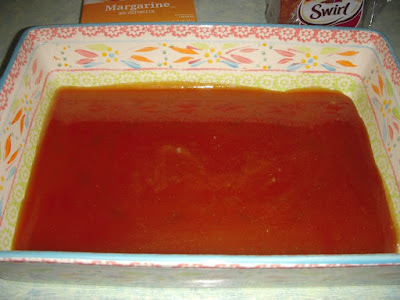 In a medium saucepan, combine the brown sugar, butter and corn syrup; cook and stir until the mixture comes to a boil. Boil uncovered 1 minute. Pour into a 13 x 9 x 2-inch baking dish, spreading to cover the bottom evenly. Arrange bread, two slices per serving, on top of the brown sugar mixture, inserting a toothpick to hold the slices together. 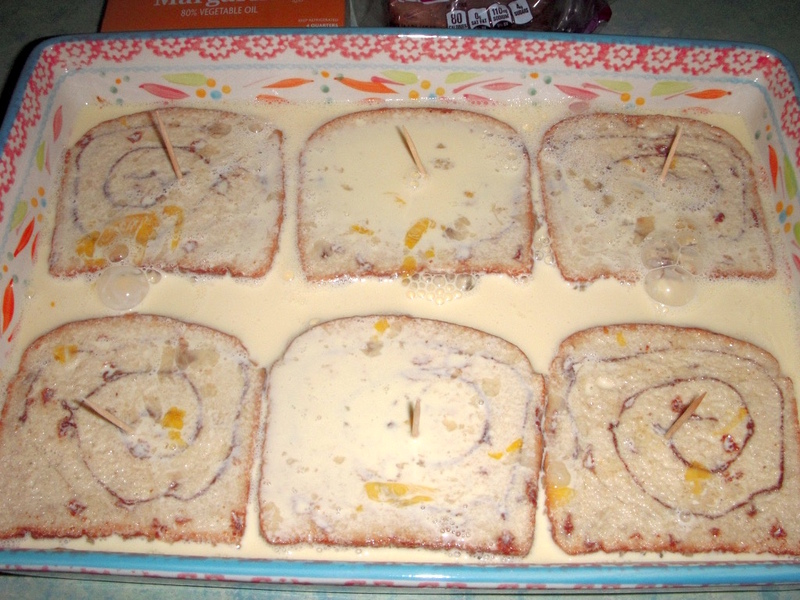 In a bowl, combine the remaining ingredients; pour over bread slices. Cover and refrigerate overnight. Preheat the oven to 350°. Let the baking dish stand at room temperature while the oven preheats. Bake uncovered for 40 to 45 minutes, or until the top is browned and puffed and a knife inserted near the center comes out clean. Remove toothpicks before serving. Refrigerate leftovers. Oh my goodness I am going to have to have to have to make this very soon. I hope you'll like the recipe. Let me know if you find a loaf of unsliced cinnamon bread. I don't think such a thing exists!